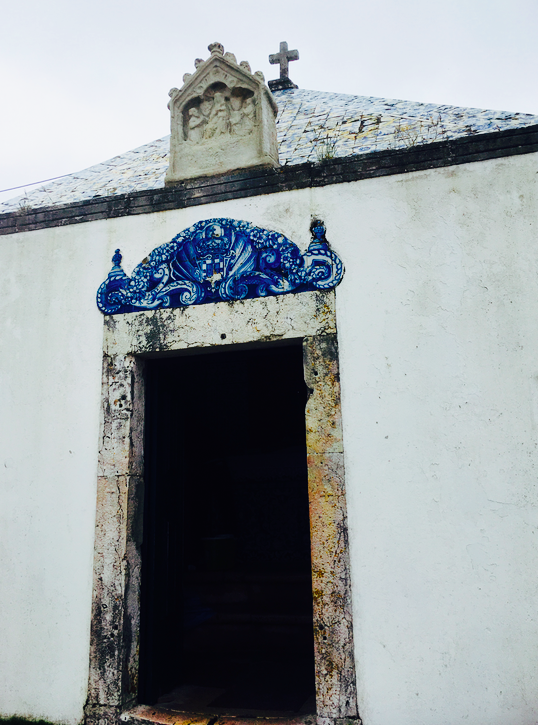 Never did I imagine that I would find a place where cobalt blue takes on such heavenly forms as it does in Portugal. Many, many shutter clicks later I have too many examples of the Portuguese love of tile. Instead I thought I’d share my fave ecclesiastical applications. The opening shot is two churches bisected by a ten-foot-wide slice of a building in the middle. Turns out, even back in the old, old days local zoning laws found eccentric expression. Overwhelmingly wonderful figurative tile work affixed to the side of the right-hand church featured in the opening photo. 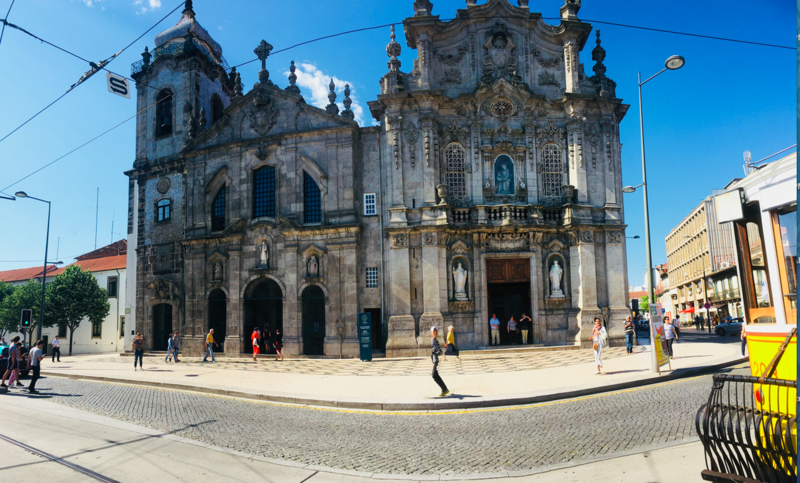 Porto certainly earns its place on the list of trendy international cities with it’s eye candy and more. 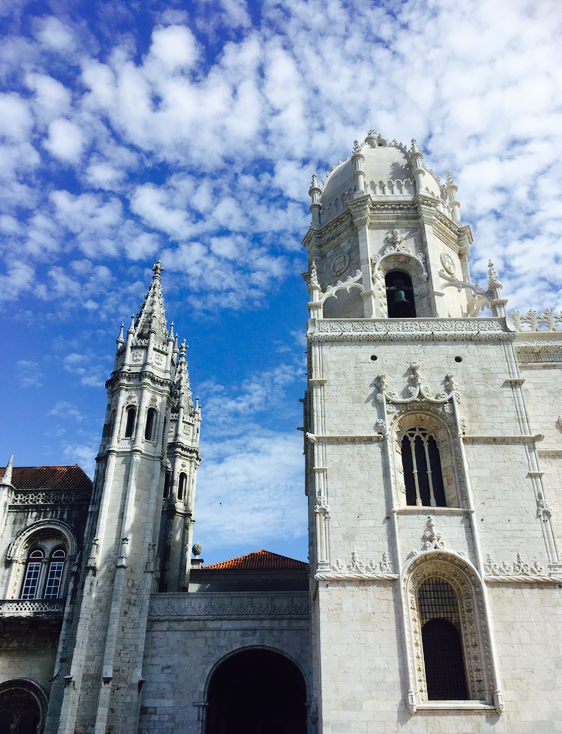 The Belem neighborhood of Lisbon is home to a magnificent monastery that glows under bright blue skies and rather delicious pastries called Pasteis de Belem. The monastery’s thrifty monks, who needed to find use for an abundance of egg yolks left over from using egg whites to starch their black cassocks, created a sublime custard spooned into a crispy shell that is the reward for hungry tourists who’ve worked up appetites strolling the church’s cloisters. Now I’m not sure if that is a Portuguese urban myth, but I like the idea of enterprising clerics finding a sweet answer to their pressing dilemma. 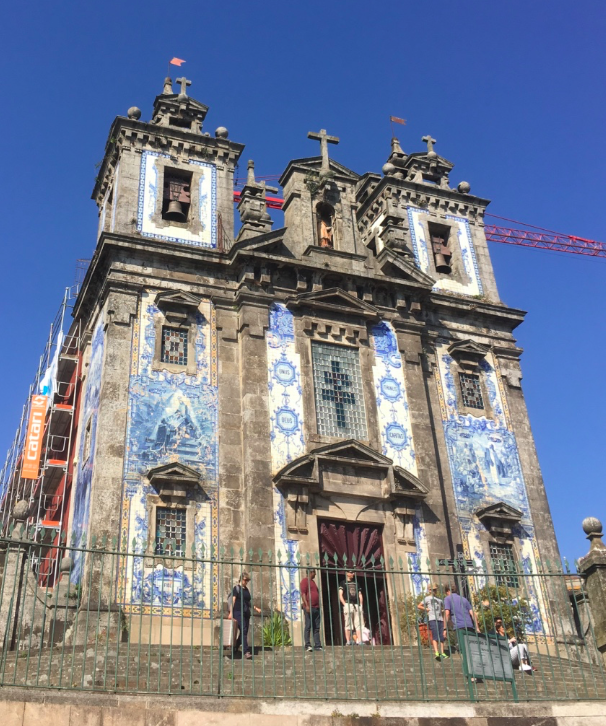 Porto has such an abundance of blue-tile-clad churches. This one resides near the Douro River. This one sits atop a Porto hill. This one is across the Douro River in the port wine warehouse district called Vila Nova de Gaia. 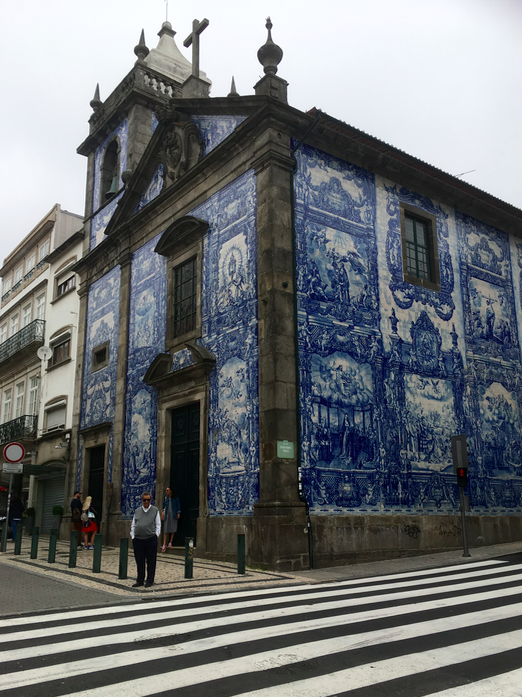 Now this church with it’s dramatic blue figurative tile is at the top end of Porto’s trendy shopping street. 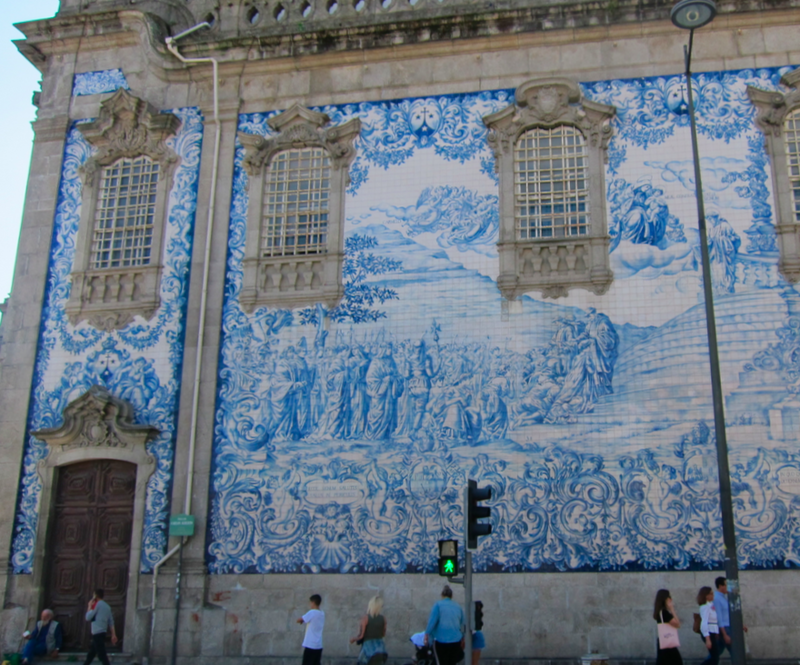 Even in Portugal’s small towns blue-white tile work makes its mark. 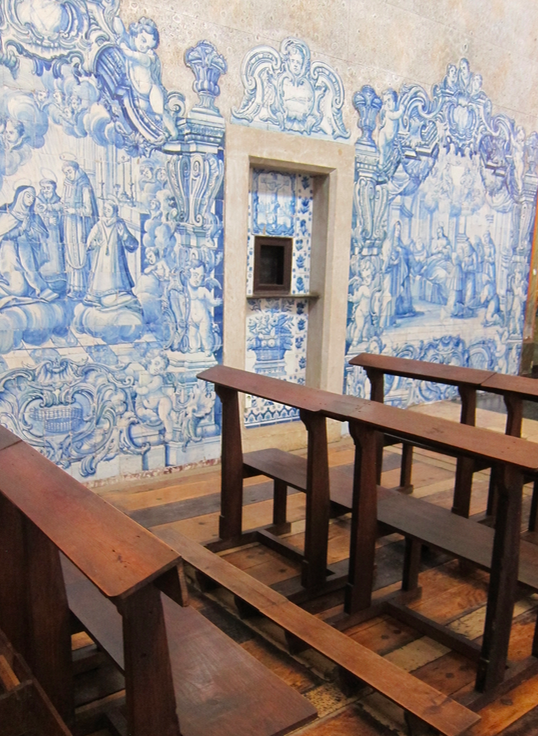 This fisherman’s chapel in the surfing town of Nazare is lovingly tended by its folk. It’s also sublimely simple after the Baroque beauties of the bigger towns. Lest you think the tile stays outside with these churches, sacred spaces wear tile inside as well. 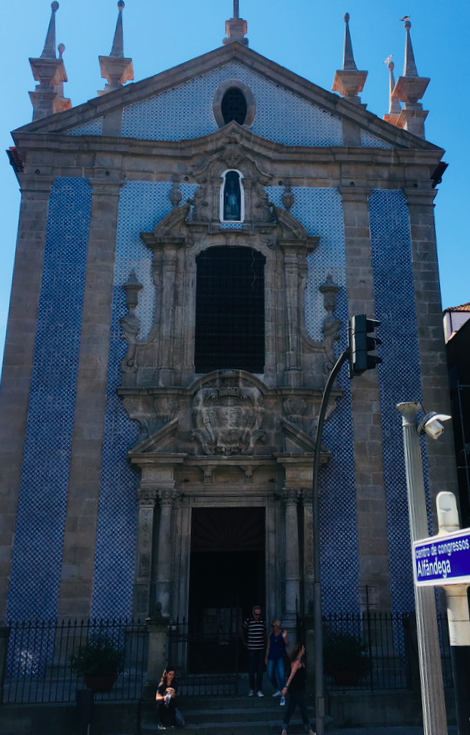 This church on a promontory in Lisbon is a favorite of mine. Not so much Baroque abundance, but still rich with imagery. 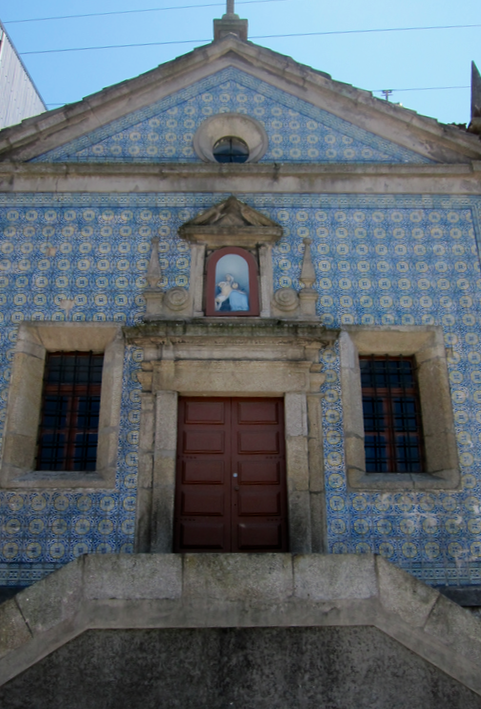 Figurative tile gives way to abundant patterned tile inside an ancient university church in the hilly city of Coimbra. 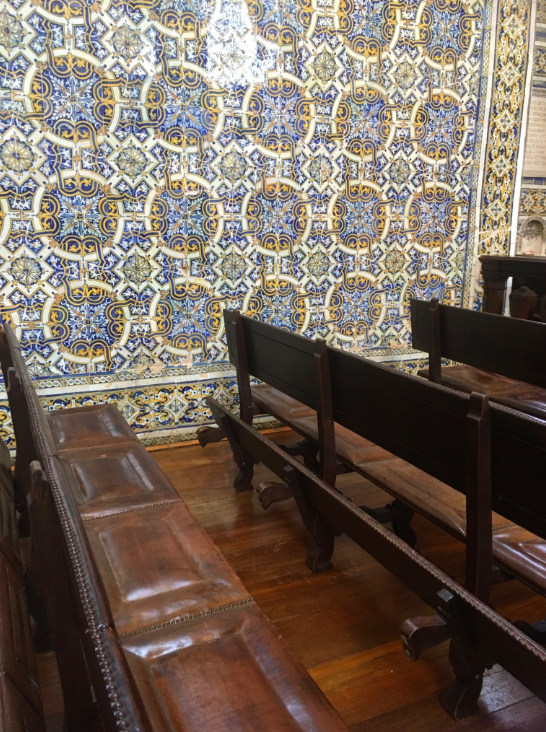 Did you notice the scholars merit leather cushioning in their pews? That could be a luxury with a downside counted in many more seated hours! A few more things to share . . .
Hey Jennifer, love, love the photos. So many shades of cobalt, which I could work with forever. With crisp white. And occasional tiny bursts of orange, maybe even fuchsia. Thanks for the inspiration! I love these beautiful images. Thank you for sharing them. The world is amazing. Hello Karen, thank you for stopping by–it’s so nice to know you are out there doing your art as well.